White or dark grey painted metal pendant fixtures. The purpose of lamps installed in vast spaces is to define the space around them. 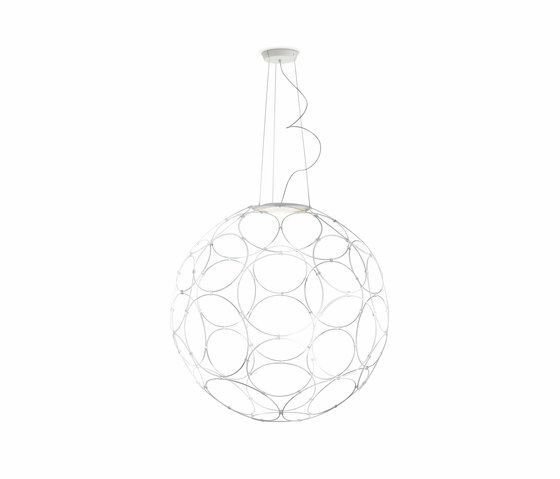 This is the main idea around which Fabian Baumann and Sönke Hoof, founders of Formfjord studio, developed Giro pendant lamps. The aim of the designers was to create a wide yet light lamp. The solution was found in the simplicity of thin round rings, which became the main elements of this project. Giro is available in two sizes both composed of 32 rings of different diameters, fastened together to form a spherical shape. These pendant lights are voluminous but light and refined objects that are available in two finishes: polished white and polished dark grey. The light source can be installed according to one’s own preference and needs, all around the metal structure. Electrification on mains voltage for Led. The lamp will be delivered in a small box, making it very efficient from a logistic point of view. It can be easily installed at destination.